I found this video recently and as I am about to publish a children’s Christmas Nativity adventure, it seemed rather apt, albeit nothing like my book! I thought it would be fun to share. Then the angel Gabriel told Joseph that, “Mary was not lying.” She..you..are having a baby. And so they met up. They went to Bethlehem, which was in Joseph’s old town. They ride a donkey. “This donkey’s fast.” They tried to go to a hotel and they asked the inn keeper for a place to stay. And the keeper said, “We have no rooms…literally, no rooms.” So Mary and Joseph walked away sadly but then he said, “The only place here in Bethlehem that you can stay is a stable” and then he just pointed the way and they followed. While the shepherds were taking care of the sheep, they saw an angel. The angel said, “A new baby is getting born…who is king of the Jews!” The angels were singing, “Glo…oh…ohoo…ooo oooo…oooo…ooooo…rius.” And then the shepherds said, “I think we should go and meet ’em.” Second, I think said, “I agree with you.” And the other said [Sigh], “Yeah, me too.” They had to walk through a bunch of grass and bushes. Maybe had to camp out a night. And then the wise men heard about it… and then a star appeared. “We should probably follow that star. It’s pointing down to that barn.” “So, maybe we should follow it. Maybe..” So, the wise men went to Jesus They gave them gifts… A stuffed animal…like a hippo one. I have at home… some nappies, and some wipes, and some milk. Gold, Frankenstein, and myrrh. And I don’t know how I would survive in that barn… too stinky too crowded. Thank you for coming. He’s adorable! He’s going to be our best friend. I love you…and…you are the best baby I have ever seen. There, I said it. The new baby is going to change the world…. I thought it would be a bit of fun to share this video and script with you as it made me smile. 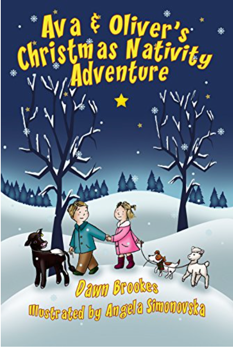 Ava & Oliver’s Christmas Nativity Adventure will be the second book in the Ava & Oliver adventure series for kids. This time the children are preparing for a very special Nativity play with some very unusual castings. They are hoping that all will go well on Christmas Eve when they perform but animals are unpredictable! The first book, Ava & Oliver’s Bonfire Night Adventure is available on Amazon in kindle and paperback.